ADECA’s offices had a bit more of an international flair Thursday as we welcomed a group of visitors from European nation of Montenegro. The group met with Clarence Mann of our Office of Minority Business Enterprise to learn more about ways the state promotes economic development for minorities and women. The Office of Minority Business Enterprise administers a certification program to identify small, minority-owned and women-owned businesses capable of providing goods or services to both government and private sectors. Mann also brought in representatives from the Alabama Department of Commerce, the Alabama Department of Transportation and Alabama State University to speak about related programs at their organizations. 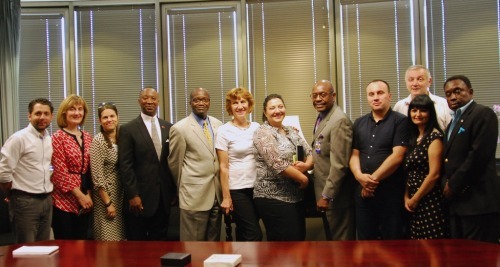 The group is visiting the United States as part of the State Department’s International Visitor Leadership Program. Global Ties Alabama arranged the meeting at ADECA. “From all indications, the visitors, as well as our partners, thought that it was quite a success,” Mann said.